Seasoned soundtrackers Mogwai strike black gold on their original score for French supernatural thriller series Les Revenants. The tense, eerie, conspiratorial vibe of the show is perfectly evoked and enhanced by Stuart Braithwaite and friends; they favour tight chamber arrangements centered around piano, guitar, bass and percussion, with aching cello interventions that bring to mind Tindersticks' work for Claire Denis's films and even some of Badalamenti's legendary cues for Twin Peaks, and they perform them with both precision and well-judged spontaneity. As with all the best thriller/horror soundtracks, each piece, even the most plaintive, is driven by an unstoppable momentum - like the characters' search for answers, and the inevitable descent into darkness that comes with it. Though the Scotch troopers generally favour a crepuscular moodiness and avoid overstatement, their are some rousing, climactic quiet-loud themes like 'Special N' to enjoy, and the terrific 'Whisky Time' nods to their post-rock forebears Slint and Tortoise, specifically Dave Pajo's magickal guitar-bass interplay with Todd Brashear and Doug McCombs. 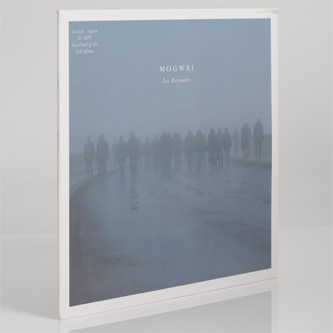 But what's most impressive about Les Revenants, in the end, is how much Mogwai sound like Mogwai, not denying their grievously honed band dynamic but rather reimagining it according to the demands of someone else's story. They're getting pretty good at this.